We will be exhibiting! We have our very own stand, and plan on filling it to the rafters with lots of fabulous yarns and other essentials for knitters. Its an honour to be able to exhibit at such a wonderful show with so many diverse and interesting exhibitors. We have plans to bring some very exciting yarns, ranging from Rare breed French Merino blends, in a rainbow of tantalising colours, to the very best of hand dyed yarns from dyers old and new. De Rerum Natura is a beautiful yarn brand from France. The majority of the yarn is made from the rare breed Merino d’Arles sheep which you only find in fields of Provence, the southern French Alps, and the Aletenjo Valley in Portugal. The sheep produce very fine fleece, but are small boned animals, so the supply is limited making this yarn even more special. We will have both Gilliatt and Ulysse on our stand. Gilliat is a semi-woollen spun worsted weight yarn, whilst Ulysse is a semi-woollen spun sport weight yarn. Both come in a range of melange colours, ranging from naturals and soft pastels which have been dyed before the yarn has been spun, to bold bright colours, which have been dyed after spinning. Its fast becoming a very popular staple yarn due to its softness and durability. The Uncommon Thread have been in our shop since the day we opened. Navel Officer was in fact the first yarn we ever sold in our online store, so its only right we take TUT along to EYF. Ce and her team have been dying since 2010, so have a gorgeous selection of colours and speckles which have stood the test of time. 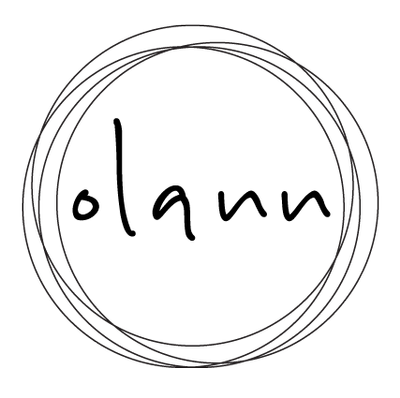 The second hand dyed yarn we will be bringing with us is from Olann, a hand dyer from Ireland. Olann is pretty new to the scene, but already incredibly popular. Her colours have a beautiful depth to them, with over lapping contrast colours, and often moody accents. We shall have Olann Sock yarn, which would certainly make for some beautiful socks! We don’t yet have it on our website, so its an EYF premiere, we will of course add anything we come home with to our website in due course. To complement the yarn, we have the perfect project bag. 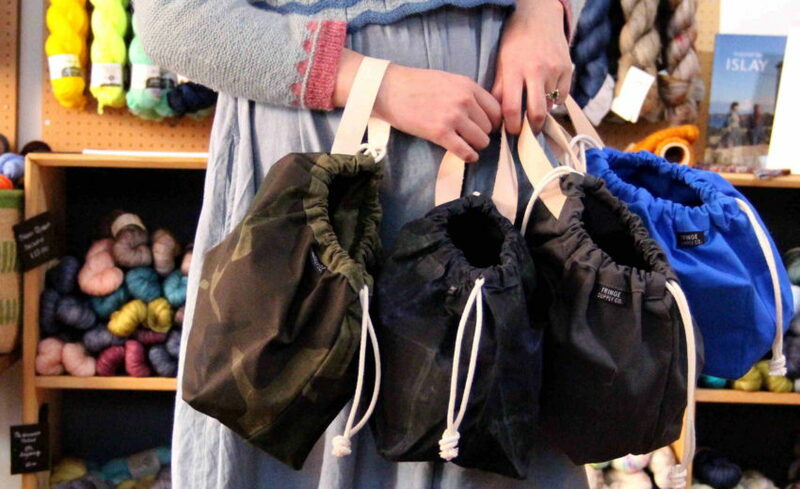 Field Bags from The Fringe Supply have long proven to be a knitters best friend and we couldn’t agree more! With us we will have the popular Charcoal, Grey, Blue and Natural colourways. Whilst Yellow Bare Wares has closed up her knitting jewellery shop, we are extremely happy to be exhibiting some of Claire’s remaining stock on our stand. 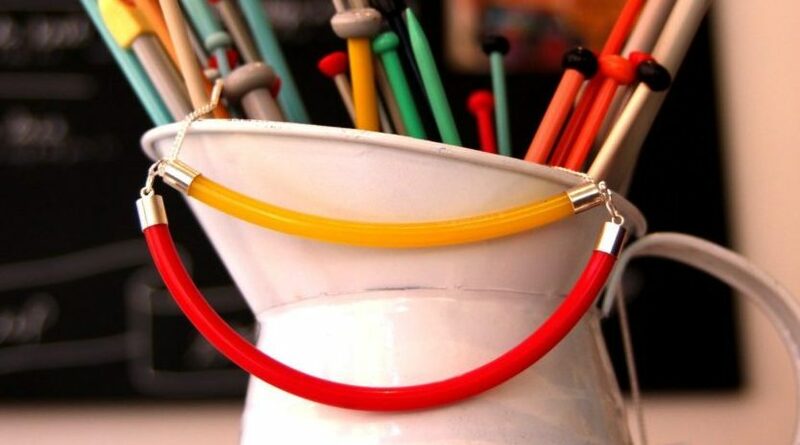 So it may well be your last opportunity to get a knitting needle necklace and earrings! Over the next couple of weeks we shall share more tantalising photos and blogs about who we are excited to see and our fave places in Edinburgh to visit, stay tuned! If there was anything you were desperate for that we have in stock, get in contact and we may be able to bring it with us. You can buy tickets to EYF here, and read more info about opening times, extra curricular fun and keep sakes. 15th-17th March 2018 (market place) Edinburgh’s Corn Exchange.